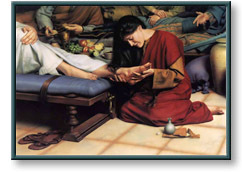 For She Loved Much portrays a woman weeping while anointing Jesus' feet. "And, behold, a woman in the city, which was a sinner, when she knew that Jesus sat at meat in the Pharisee's house, brought an alabaster box of ointment, And stood at his feet behind him weeping, and began to wash his feet with tears, and did wipe them with the hairs of her head, and kissed his feet, and anointed them with the ointment." Matted Size:............... 8" x 10"
The image size is 5" x 7". This print comes double matted with a light cream mat on top. For She Loved Much copyright © 2001 by Simon Dewey is prohibited from being copied.